'Hopleys', sold under the trade names of MISS LEMON and TWIST OF LIME, was raised and introduced by Hopleys Plants, Ltd. of Hertfordshire, United Kingdom. 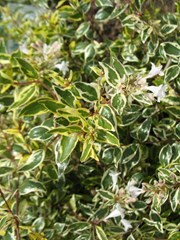 It has variegated foliage that is yellow with green centers when young, maturing to ivory and green. Its bell-shaped flowers are light pink to lilac and bloom for a long period in summer and fall. 'Hopleys' grows 3 to 4 ft. tall and wide.